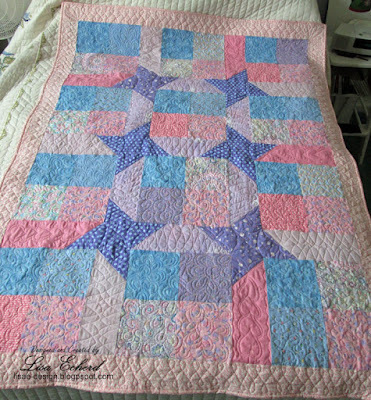 This quilt was completed for the Linus project. This organization pairs quilts with children in need of security. Just as Linus had his security blanket, a handmade quilt or blanket gives comfort to a child. I shopped my stash first and then added a few other fabrics for the pink and lavender color scheme. The pattern is a combination of a couple of designs I saw in Crafty classes. 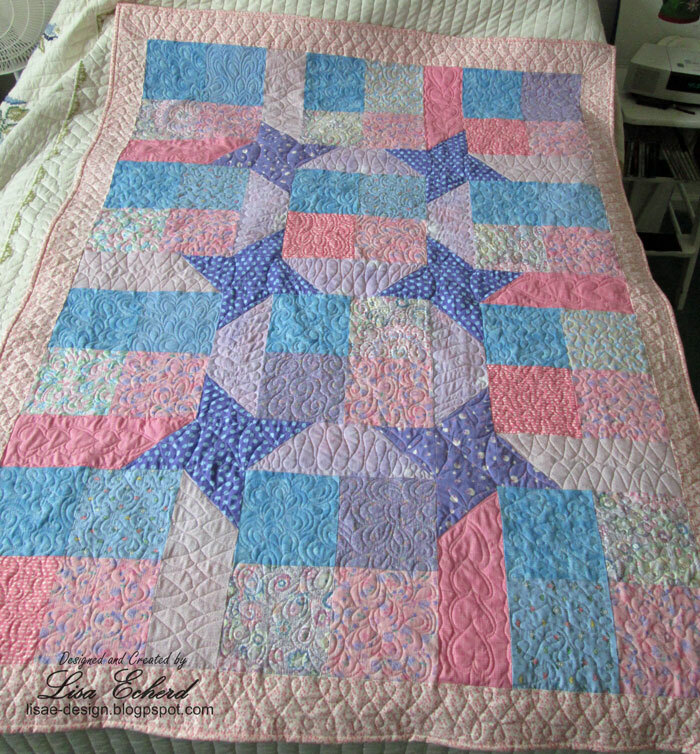 It is a simple 4 patch design of 6 1/2" squares joined together with friendship stars in the sashing. I got to practice several free motion quilting designs while quilting. I quilted this one as one large piece. For the next quilt, I'm dividing it up and that is part of what the video is about. The Hourglass quilt made from some fabrics from Northcott's Chloe collection and many others that I've found will be a large bed quilt for us. I love the red, yellow and teal color scheme. I filmed this the weekend that Hurricane Florence made its way across the Carolinas. I left that part in the video even though I'm just now getting it posted. After Florence cleared and we knew we had no problems, we left on a trip so I'm just getting home and caught up. I've never done so much advance prep for a storm. I did so much that I really didn't end up cooking much the actual weekend of the storm. I think my Dh got a little tired of eating my 'storm food' even though much of it was home baking I'd done in advance. We were fortunate to only get 5 inches of rain, a little wind and not lose power. Many of use still remember Hugo (1989) for which we were not prepared and had a 5 day power outage here 260 miles inland. Since I filmed this, I've started the actual quilting. The results are mixed and I try to remember I'm still learning to machine quilt.